5 OPINIONS How can planning be improved for investors? – Judith Salomon; The culture of planning needs to change – Mark Southgate; The planning framework should start with a design – Roger Zogolovitch; A cycle-ised city is a civilised city – Peter Murray. 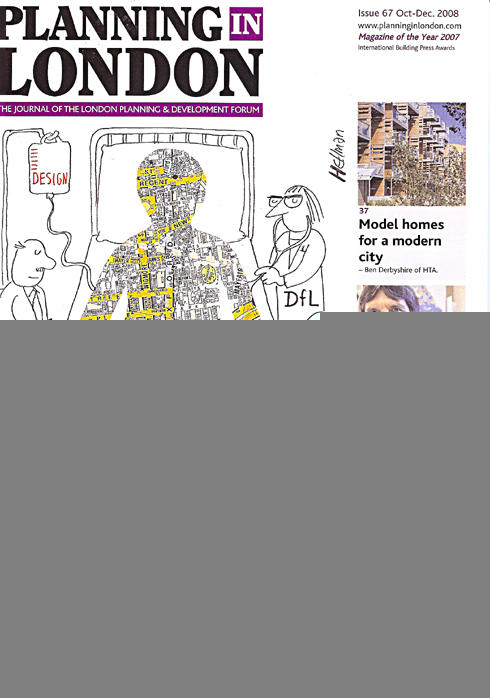 9 London First: West End 2012; New Mayor – New London Planning Awards; Getting the Community Infrastructure Levy right. 12 BRIEFING: PINS’ performance improves – Andrew Rogers; New applications and performance both slow – CLG; The interactive house – Andrew Rogers. 20 Changing priorities in a changing world – Steve Quartermain, the new Chief Planner at CLG. 21 Plan-led or plan dead? – Mark Southgate, Head of Planning, Environment Agency. 23 The road to renewal – John Letherland, a partner with Farrells. 28 Beyond live/work – Frances Holliss. 31 Accommodating diversity whilst meeting density targets – Alex Ely of mæ Architects. 34 Underground: London’s hidden infrastructure – Andrew Scoones. 37 Model homes for a modern city – Ben Derbyshire is managing director of HTA. 39 Over the edge: town centres and the London economy – Dr Nicholas Falk, director of URBED. 42 Compulsory purchase – lessons from Croydon Gateway – Simon Ricketts, head of planning at SJ Berwin. 45 BOOKS: London Voices London Lives. Peter Hall reviewed by Iain Shaw, an architect with Hughes Jones Farrell. 47 DIRECTORY: Planning & environment reference guide; 50 Subscription form; 51 Advice.